“Brothers, the Scripture had to be fulfilled, which the Holy Spirit spoke beforehand by the mouth of David concerning Judas, who became a guide to those who arrested Jesus. For he was numbered among us and was allotted his share in this ministry.” (Now this man bought a field with the reward of his wickedness, and falling headlong he burst open in the middle and all his bowels gushed out. And it became known to all the inhabitants of Jerusalem, so that the field was called in their own language Akeldama, that is, Field of Blood.) “For it is written in the Book of Psalms, “‘ May his camp become desolate, and let there be no one to dwell in it’; and “‘Let another take his office. '” (Acts 1:16-20). Akeldama, south of Jerusalem. Photo by Leon Mauldin. Our photo shows the traditional site of Akeldama at center, just beyond the valley. This is the area were the Kidron and Hinnom valleys converge. The structure you see is a Greek Orthodox Monastery, built in 1874, named after Onuphrius, an Egyptian anchorite known for the length of his beard. This area was identified as Akeldama as early as the third and fourth centuries. The earliest chroniclers—Eusebius, who visited the land in 335 A.D., among whose writings was a life of the Emperor Constantine, and Jerome, 400 A.D., the author of an onomasticon (a list of proper names, which sought to locate sites hallowed by Scripture)—both identify this place with confidence as the Field of Blood referred to in the New Testament. In 570 A.D., the pilgrim Antoninus made the same identification. (1994). BAR, 20(6). Even so, the Ritmeyers think this site to be implausible as the Field of Blood, because “here are some of the most splendid Herodian tombs ever discovered” . . . “a field of elegant and elegantly decorated burial caves.” “One of them probably belonged to the high priest Annas” (Ibid.). This entry was posted on Wednesday, August 9th, 2017 at 12:22 PM and is filed under Bible History and Geography, Israel, Jerusalem, New Testament, photography, Travel. You can follow any responses to this entry through the RSS 2.0 feed. You can leave a response, or trackback from your own site. 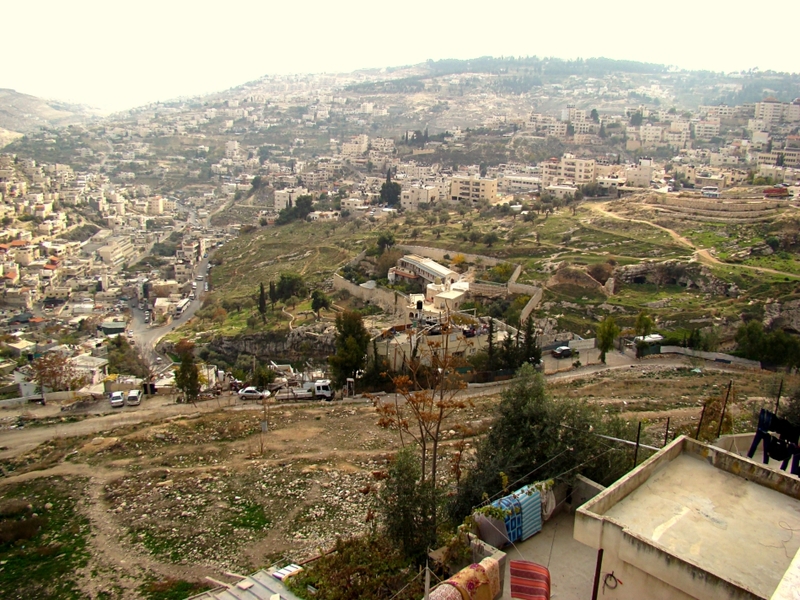 I heard once that Judas chose this place because it was the burial place of Annas and that would taint the land of the High Priest because it was that group that tempted him to take the money and betray Jesus. (?) If he hung himself, was it in this same field? Two stories…hanging and bursting open…. If I ever get well enough, I would love to take a Holy Land trip with you as a guide. Great to hear from you! I would love for you to be able to travel with me to the Bible lands! Regarding the two accounts (Matthew & Acts) of Judas’ death, Wayne Jackson writes, “But how does one reconcile Matthew’s record that ‘he hanged himself,’ with Peter’s declaration that he fell headlong to that his body cavity broke open and his internal organs gushed out? The language necessitates no conflict. Either he hanged himself from a very high place–with perhaps the rope breaking; or else, no one removed his body for a while, it eventually fell under its own weight, and the decomposing corpse burst open” (The Acts of the Apostles: from Jerusalem to Rome, p.15).